A ROTUND Piri Weepu has told critics to "get a life" after coming under fire on Twitter for his weight gain. One person told Weepu: "Maybe you should hit the gym and get into shape to help out your struggling team!" Weepu replied: "Sorry, I didn't know one person makes a huge difference ... I'm doing me, mate!! Making sure I'm good for them! Worry bout u, mate." Another tweet - which has since been removed - had Weepu responding: "Get a life, mate." The 28-year-old's waistline has noticeably expanded since playing in the Rugby World Cup, when he weighed 94kg, according to the All Blacks' official website. This year's official statistics still have him at 94kg. This week Weepu fronted media about the issue, saying he was disappointed with himself. "I just enjoyed my break. Eight years to achieve something like that - I guess all the disappointment's only from myself and I guess I'm working harder in the background. "When I first got here [to the Blues], obviously I was a bit out of shape but I've made gains on that and I'm continually doing that and moving forward." 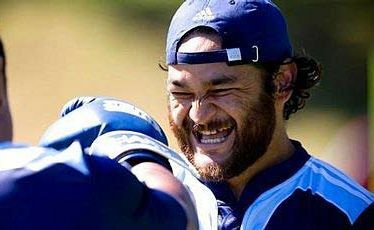 A Blues team spokeswoman said neither Weepu nor the team's staff would be speaking about the issue until at least after the game against the Sharks. "Piri fronted on it and that was it - it was difficult - and he did a good job. He stepped up." Sports dietician Dane Baker, who works with the Chiefs rugby team, said he understood exactly what the player was going through as many athletes he dealt with also struggled with their weight. "I've worked with lots of players that would always come back post-season who would be quite over-weight. With all athletes, especially those that take off-season or are injured, just the lack of activity and training plays a big role. "If they're over-eating slightly, it's going to make a big jolt on body weight." Mr Baker said a number of players with Maori or Pacific backgrounds sometimes struggled to maintain their weight during off-season because of foods they ate with their families. "If they really like food, it's always a bit of a struggle. Maori or Pacific Island foods can be high in fat and high in carbohydrate. So for those guys, if they eat a lot of those foods and then they become injured or not do much activity, they can really struggle." Weepu has tweeted pictures of his food creations and also about his cravings. One picture shows a platter piled with crayfish, tiger prawns and fish. Another shows off chicken and corn soup, as well as spaghetti carbonara. He famously got a kilo of fresh kina delivered to him by a group of teenage girls during the World Cup, after he tweeted that he was craving the delicacy.